Giveaway: Ciracle Pink Powder from WISHtrend.com | Memorable Days : Beauty Blog - Korean Beauty, European, American Product Reviews. My previous giveaway has ended and since it's December I'm going to host more giveaways this month. Don't get me wrong I don't want to become a blog with tons of giveaways or something. I'm a person who likes to thank my readers by giving items away that I adore myself. Today i'm going to give away one of my holy grail products, a product that i use very often nowadays. Can you guess which product it is? YES! 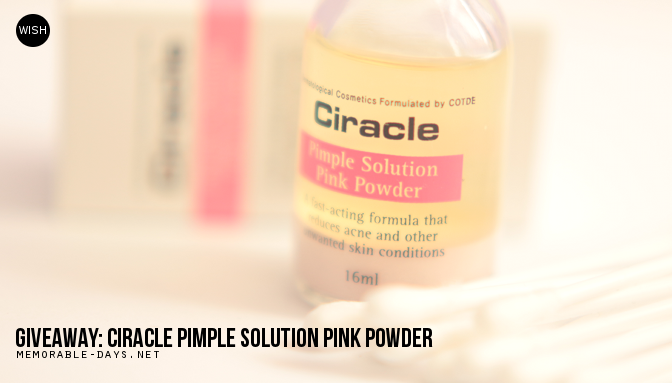 It's the pink powder pimple solution of the brand Ciracle (link to my review). This giveaway is a collaboration with online Korean shop WISHtrend.com. This product is amazing for pimples! This is what I wrote in my review: "I've been breaking out on my neck because I used a new night creme. I suddenly had lots of pimples at my neck area and they were itchy as hell (OMG!). I was so happy that I was able to put this on my pimples. It stung a little bit when I applied it since it contains alcohol too. However, i directly noticed that it wasn't itchy anymore, it had a cooling effect and the pimples were dried up in a few minutes. The next day when i woke up I noticed that the redness was reduced and the size of the pimple was smaller. HOW AWESOME?! I kept using it at night for a few days and my pimple is almost gone now o.o! How amazing is that? It really does what it claims!" For the full review... GO HERE. If you would like to purchase this product yourself, this is the link to the product. Feel free to use my coupon code MEMORABLEDAYS to get 5% OFF at checkout! They offer worldwide free shipping when purchasing for the first time! GIVEAWAY TIME - HOW TO WIN THIS PRODUCT? There will be 3 lucky winners, each will win one bottle of pink powder from Ciracle. This giveaway is open internationally and will end on the 16th of December 2013 (at night, European time). There are a few rules that you gotta follow to be able to enter this giveaway. Just follow the questions in the form below. YOU MUST DO THE FIRST 5 STEPS TO BE ABLE TO ENTER THIS GIVEAWAY! These 5 steps are mandatory, the rest of the questions that you will see are optional. To get more entries answer the other questions that you will see after the first 5 steps. GOOD LUCK!